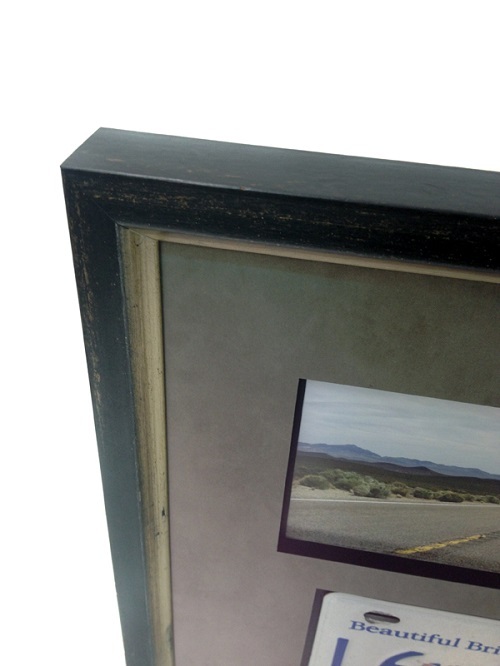 Three dimensional objects are often overlooked when it comes to framing. 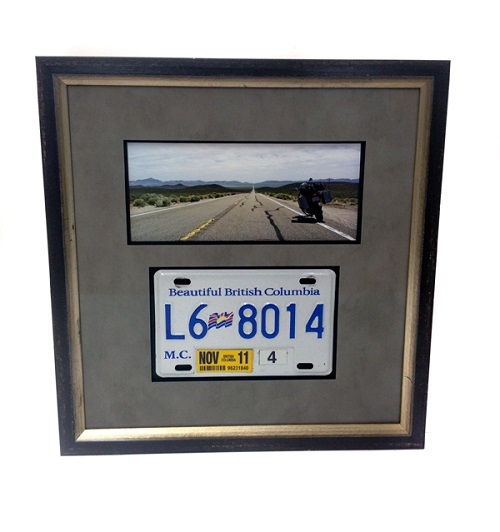 At Framagraphic, we are open to any challenge, particularly when it comes to unique framing subjects. 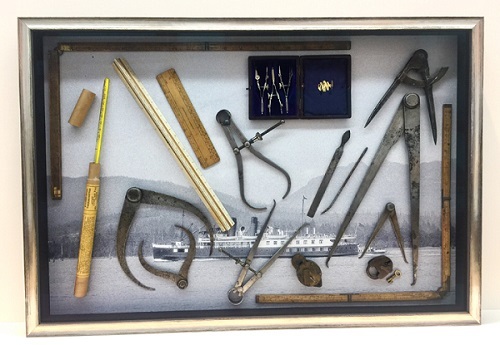 Object framing typically requires a shadow box to be built. These are deeper boxes that will stick out at least 1-1/2 inches away from the wall. Is there a weight or size restriction? No. 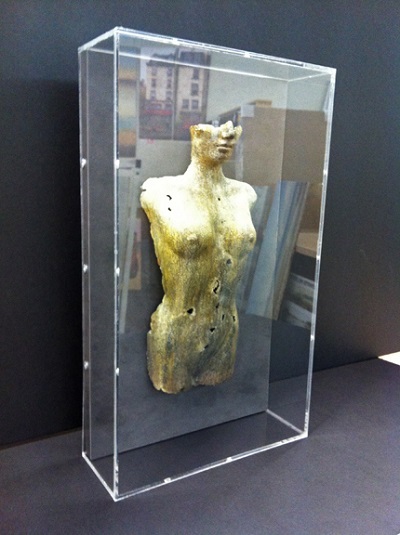 Our framers are particularly skilled at finding solutions for oversized pieces. 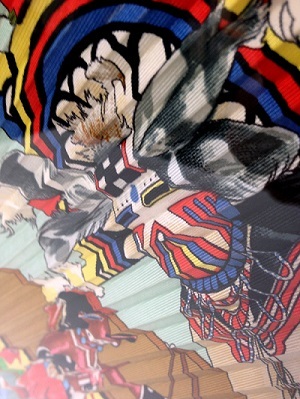 There are a number of materials that can be used to reinforce the frame, the object, or the backing. If you have a project in mind, we will be able to construct something that will work for you. 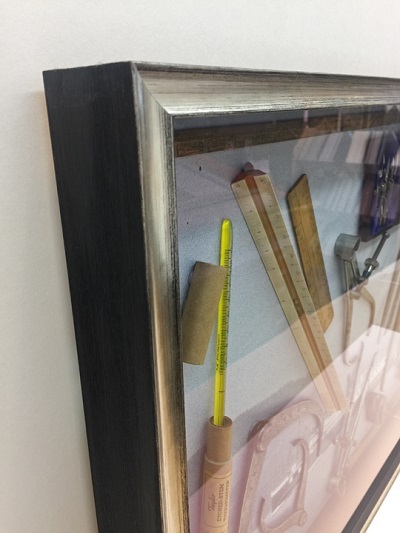 One way to lighten the load on a frame is to use acrylic instead of glass. 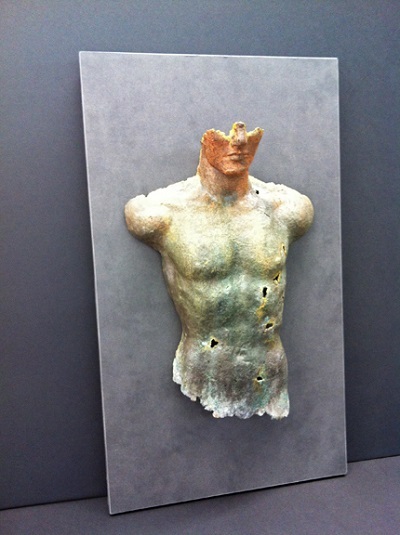 It is a far lighter material, and it is virtually impossible to break. How do you hang something that is very heavy? 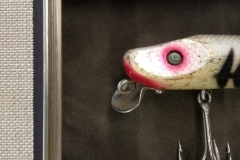 We often recommend using wall buddies as opposed to a wire or teeth for hanging a heavy frame. Wall buddies are drilled into the corners of the frame, and are extremely stable. Wall buddies are able to support up to 65 lbs. For objects over 65 lbs, a wall anchor would be used. How do I install an object frame in my space? We are more than happy to offer both deliveries as well as installation services. We have all the tools and equipment needed, and sometimes hanging is just easier with an extra hand. 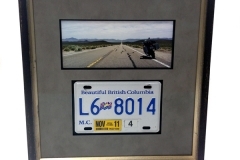 With Father’s Day just around the corner, we decided to frame up a photo of Gerry’s old motorcycle and his license plate. 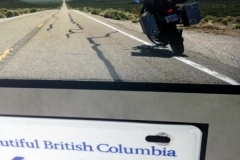 He recently had to part with the bike, but kept the plate as a souvenir. 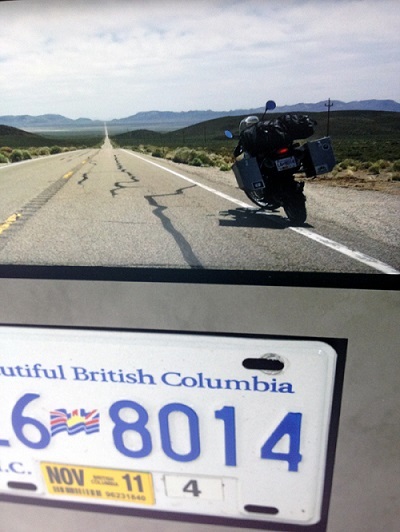 The photo was taken on Hwy 14 in the Nevada desert, the ‘loneliest road’, and part of the original pony express. 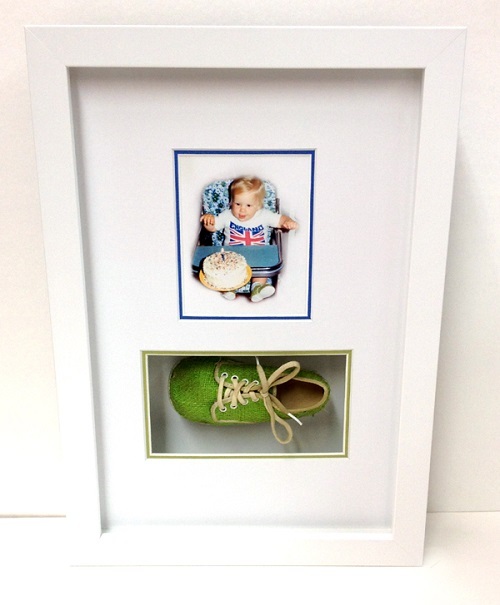 Another great idea for Father’s Day: framing the little tykes baby shoes. 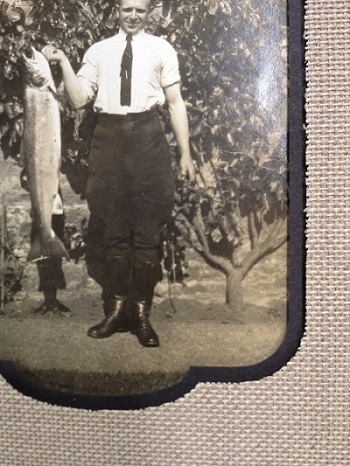 The customer brought in this picture of her son, who is now in his forties, along with the very same shoe he was wearing in the photograph. 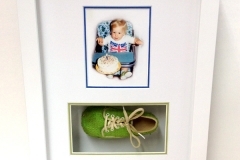 They went with a classic, modern white frame, with double matting that accentuated some of the colours in the photo and in the shoe. 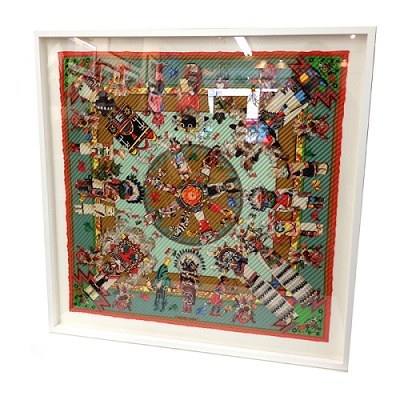 One of Framagraphic’s Top 5 most challenging framing jobs was this absolutely beautiful silk Hermes scarf. 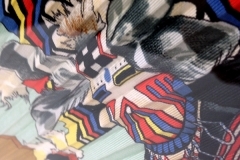 The customer had received the scarf as a gift, but felt it was closer to a work of art than a piece of clothing. The scarf was pleated from corner to corner, and had to be carefully stretched with each fold laid evenly out on the mat. A laborious project to be sure, but a challenge Keith readily took up. The finished product turned out beautifully, and truly was a work of art. A few weekends ago, a large and bubbly family came into the store with a vintage Leica camera- one of their late grandfather’s favourite possessions. 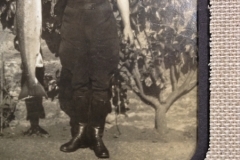 They had spent some time scouring their own belongings, and were able to find a photograph of their Grandfather holding the Leica, along with the well-used camera strap. The challenge was that the camera itself was much deeper than most of the frames. To build something that deep, we would have to layer a number of frames on top of one another – stacking them to make them deeper. Luckily, Larson-Juhl has a moulding that is designed specifically for stacking. It is essentially a three-part frame that ends up being approximately 5 inches deep. 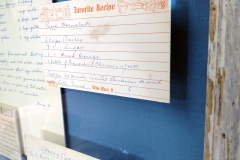 The frame had a curved profile, giving it a soft vintage feel which happened to be perfect for this project. 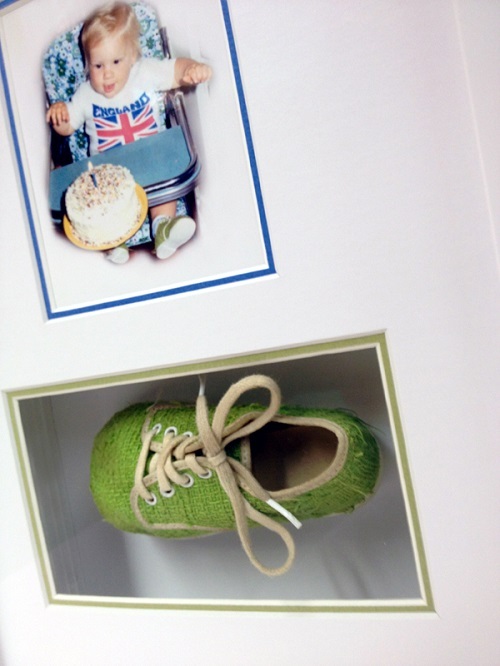 Fabric matting was used to line the inside of the shadow-box, with openings for the photograph and the plaque we had made for the family. 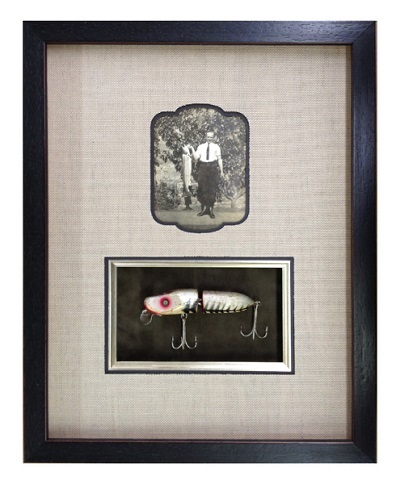 The finished frame is perfect for either mounting onto the wall, or resting atop a mantel or shelf. 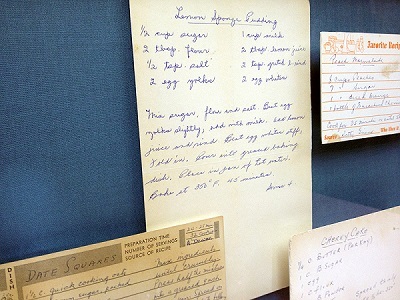 “Peach Marmalade,” “Lemon Sponge Pudding,” “Cherry Cake,” and “Date Squares” make for a pretty appetizing framing sample. 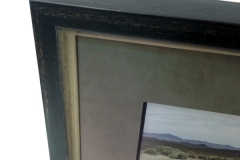 We used a blue linen mat as the background, and a distressed wooden frame with a rustic country-kitchen feel. 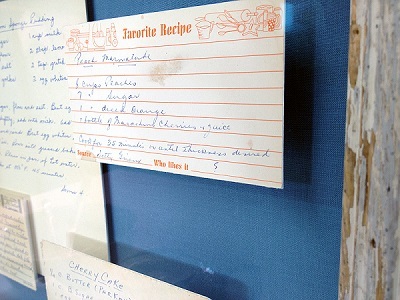 The recipe cards were raised and floated at different heights, making them seem to pop-out from the background. 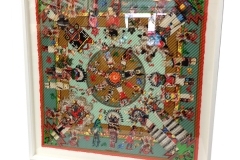 This also allowed Keith to create the look of a collage- where some of the corners of the cards overlap against the others. 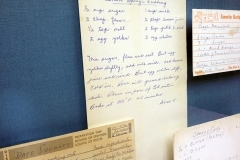 Visit the store to see a closer look, and we’ll even let you copy down the recipes to take home! 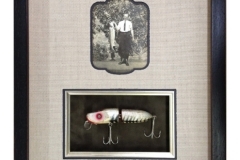 This shadow box pairs a vintage photograph of trophy fish, paired with a bait-shaped fishing hook. 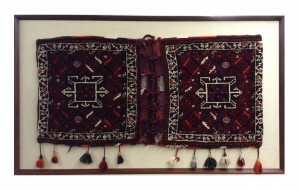 The frame is a deep wood frame, with a small line of red that trims the outside edges. The top mat is a tweed finish, with a bottom charcoal mat. 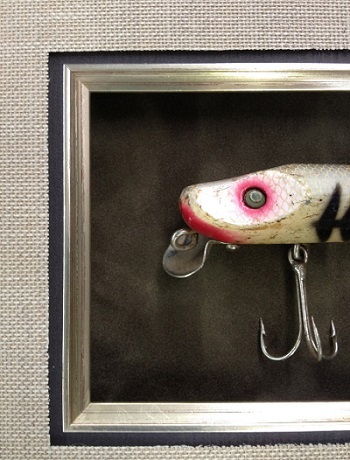 The fishing hook is inset into the frame, with an suede olive mat underneath. 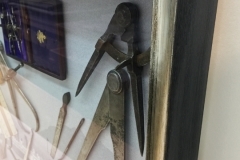 The space where the hook is mounted is further framed by the wood fillet (one way to create the appearance of a frame within a frame). 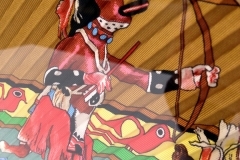 The gentleman with his prized fish is set inside a decorative opening. 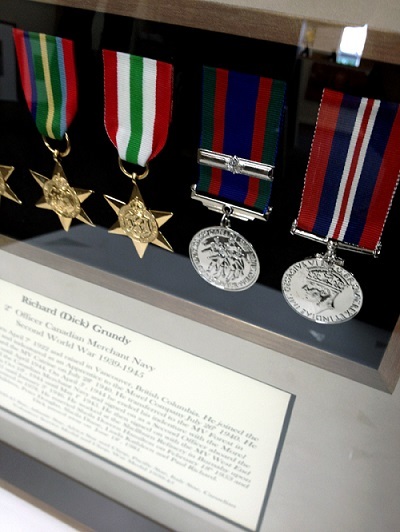 Medals and awards generally commemorate a significant time or achievement in a person’s life. 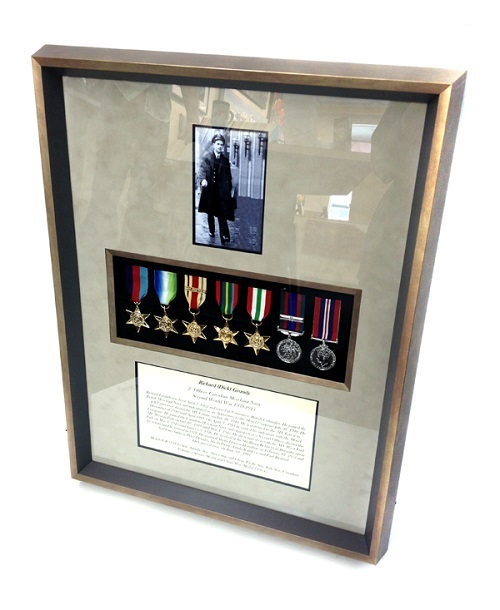 Framing them is a great way to preserve that story for generations to come. These Turkish camel bags came from a customer’s travels abroad. The wool bags were mounted onto an MDF support board which was covered with fabric, to create the appearance of a linen liner. The MDF supports the weight of the bags, allowing the frame to be simply decorative. 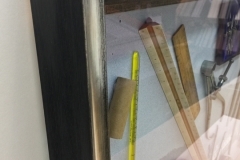 The final frame came to a size of 66″ x 38″. We are currently in the process of restoring the shadow box that was made for this autographed symbol. 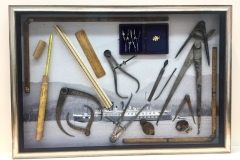 Musical instruments are often made quite interesting when placed in an object frame. 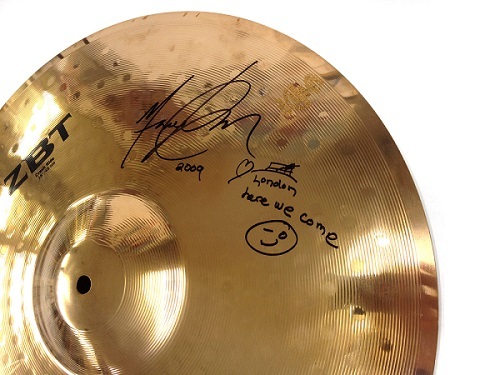 You are able to see the wears and tears of these pieces, where each mark and dent is a reminder of the passionate playing that happened at a concert or a show. This pair of male and female sculptures were brought to us from a customer who acquired them from a gallery on Granville Island. 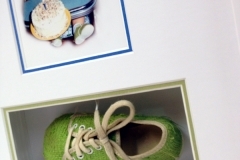 For the framing, we outsourced the acrylic boxes, doing the rest in-house. 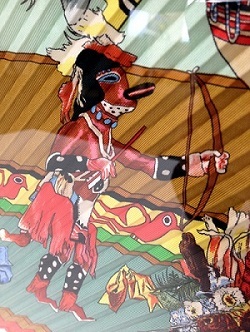 The figures were mounted on a wooden backing frame which we covered with an iron coloured matboard. The steely greys are an interesting pairing for the colour and texture of the figures. 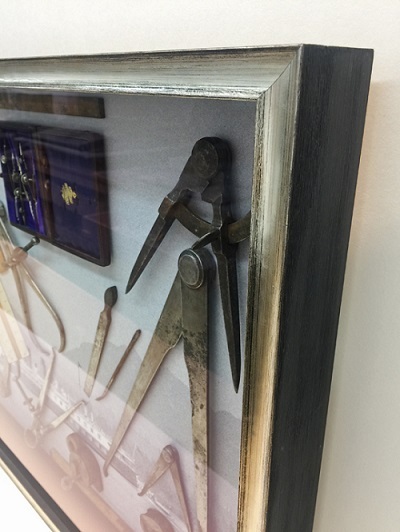 Come check out your premier framing store in Vancouver, or contact our professional framing team for any questions you have about your framing needs.